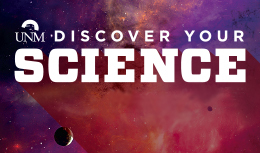 Discover Your Science is an opportunity for you to learn more about science majors, research projects, cutting-edge technology, student organizations and student support programs at the University of New Mexico. It is a celebration of science, an introduction to new friends, and a jump-start on planning your science career. Discover Your Science will be held on Saturday, August 18th, 2018. During the Discover Your Science, you will meet professors, undergraduate and graduate students, and other individuals who will be important to your future success. You will engage in activities that introduce you to key concepts and opportunities. Break-out sessions with faculty and advisors! Lab tours and hands-on events all over campus! PLUS: A free showing of the movie Black Panther starting at 3pm. And more! Click to get started! Who can attend: New freshmen plus families and friends. What to bring: Yourself and your curiosity to discover!